Aragonese Way, 6 stages, 23 hostels, 197.3 Km. The prolongation of the Vía Tolosana along Spain is known by the Camino Aragonés (Aragonese Way) or by the Camino Francés por Aragón (French Way through Aragón). In Arles, on the banks of the River Rhône, the Via Tolosana (one of the four great Jacobean routes along with Turonense, Lemovicense and Podense) brought together pilgrims from Provence and Italy, as well as many others from Central Europe. There were numerous abbeys and priesthoods in France, providing prayer, food and rest on the long and arduous road that led to the Somport mountain pass. The meeting point was the famous Benedictine abbey of Saint Gilles, and one or two days later they stopped in Montpellier, a prosperous trading town blessed by its geographical location. Later on, the Via visited Saint-Guilhem-le-Désert, where the remains of William of Orange, Charlemagne’s cousin, rest. Today, this picturesque medieval village, which was found by the boost of the abbey of Gellone, has the hallmark of ‘The most beautiful villages in France’. Pilgrims passed by the Usclas-du-Bosc castle afterwards, managed by the knights of San Juan. The pilgrims’ road followed through Lodève and visited the Benedictine abbey of Joncels, prologue to a journey of a bit more than a hundred kilometres that led to Castres, a village flourished thanks to the abbey founded in the 7th century by Saint Benedict of Aniano. From here, about 80 kilometres separated the pilgrims from Toulouse, an important place of pilgrimage supplied with hospitals where they received care, such as Saint-Jacques du Bout-du-Pont and Notre-Dame-du-Puy. Pilgrims venerated the relics of San Saturnino, first bishop of Toulouse, in the basilica of Sernín, wich was consecrated by Urbano II in 1096. Like many other religious buildings of this pilgrimage route, that temple is part of the property inscribed on the Caminos de Santiago in France, which were declared a World Heritage Site in 1998. The rosary of places and pilgrims’ hospitals continued through Colomiers, Léguevin, Pujaudran, Gimont, Aubiet and Auch, historical capital of Gascony laid on the banks of the River Gers. At the medieval core, which rises on a hill, stands out the cathedral of Sainte-Marie d’ Auch, which was built in the 15th and 16th centuries over the ashes of the old Romanesque cathedral. The pilgrims’ itinerary continued through Barran, L’ Isle-de-Noé, Montesquiou, Saint Christaud and Maubourguet, reaching Morlaàs, which became the capital of Bearn viscount during the 11th and 12th centuries. The beautiful Romanesque church of Sainte Foy dates from that period. Less than five hours’ walk, the road reached Lescar, the old Beneharnum. The town, a modern day satellite of Pau, consecrated its first cathedral in 1062. After Artiguelouve and Lacommande, inheritor of the medieval order of Le Faget, Oloron-Sainte-Marie waited for walkers, where they recovered strenght to face up to the Pyrenean Aspe Valley. Through Saint-Christaud, Escot, Sarrance, Accous, Lescun and Borce, the pilgrims overcame a tremendous unevenness that led them to Somport mountain pass, the fabled Summus Portus. As soon as pilgrims surmounted the Somport mountain pass they found shelter in the hospital of Santa Cristina, whose foundation is confused. This one refers to the legend that tells how two French knights built the hospice in the place indicated by a pigeon that, at that time, carried a golden cross in its beak. Santa Cristina obtained the invaluable patronage of monarchs and nobles for several centuries, especially from Alfonso I de Aragón, El Batallador, and Gaston IV, viscount of Bearne, which allowed to enlarge the patrimony and the orders of the institution in lands of Bearne and Aragón. The prestige and popularity of the hospital of Santa Cristina were immense and for that reason Santa Cristina was already cited in the chapter IV of book V of the Codex Calixtinus, compiled in the 12th century and attributed to the French monk Aymeric Picaud. The quote defines it as “one of the three necessary columns to sustain the poor”, together with the hospitals of Jerusalem and Mont-Joux. After several centuries of splendor, the hospital began to glimpse its decline. The book of reference Las Peregrinaciones a Santiago de Compostela, written by Parga, Lacarra and Uría, fixes the beginning of the decadence of the institution in 1374, that later would be sentenced with the loss of possessions in Bearne due to the wars of religion between Huguenots and Catholics. In November 1610, the old hospital of Somport was visited by the Portuguese cosmographer Juan Bautista Labaña, who described Santa Cristina as “a small and bad building; there is a church and high choir in it with cells… In this monastery lives a Dominican friar; next to it there is a large inn for the travelers”. Aymeric Picaud, the religious of the Poitou region, provides with valuable details of the itinerary of Somport: “The following villages are located on the Camino de Santiago. First it is Borce, at the foot of the mountain in the Gascony part; then, past the top of the mountain, the Hospital of Santa Cristina; then it is Canfranc; later Jaca; then Osturit; then Tiermas, where there are royal thermal springs that flow hot; then Monreal; finally Puente la Reina“. The Roman road leading from Zaragoza to the Bearn traces this same itinerary to Tiermas, as Isaac Gallo, specialist in Roman engineering, shows in depth in his book Item a Caesarea Augusta Beneharno. The Roman road from Zaragoza to Bearn. The first pilgrims would use this road, whose remains rest in many of its sections under the N-330 between Somport and Jaca and under the N-240 between Jaca and Puente la Reina de Jaca. From this last town to Ruesta, the Roman road overlaps with the current Camino de Santiago or runs in parallel at a short distance from it. 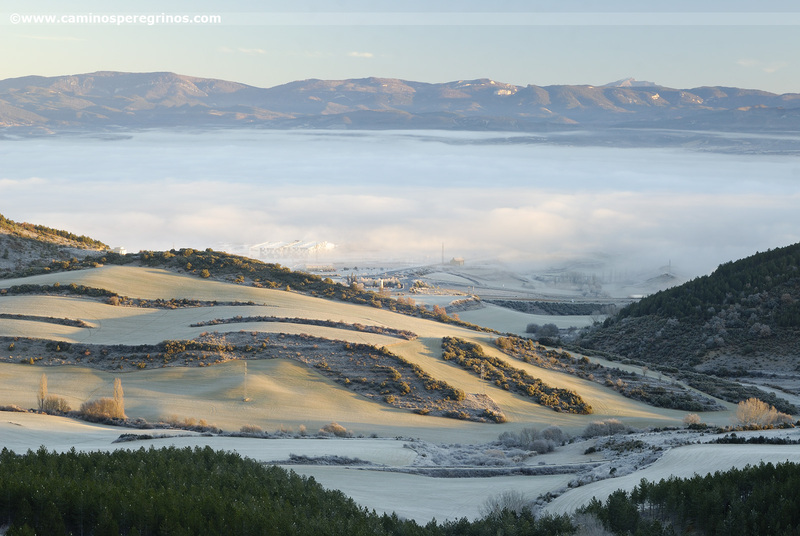 Today, the Camino Aragonés leaves Ruesta and goes into the Peña Musera mountain range towards Undués de Lerda. 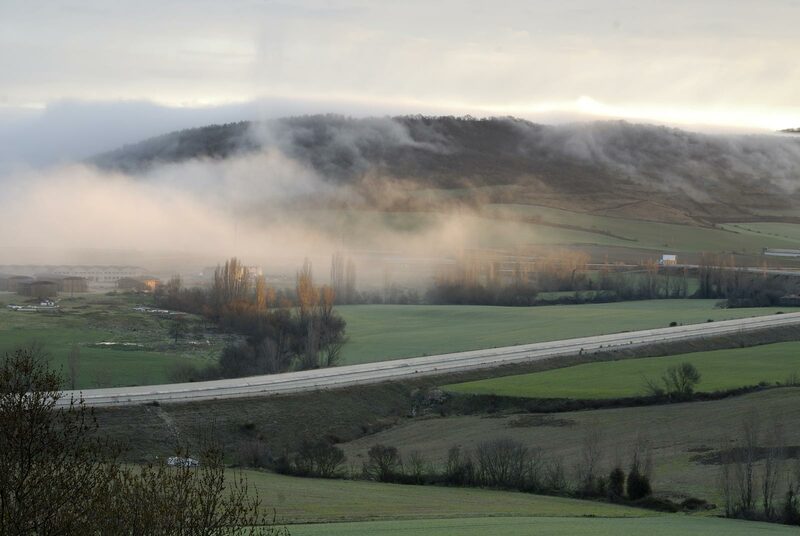 On the other hand, the Roman road lies under Yesa reservoir, therefore it led from Ruesta to Tiermas and, later on, it visited the village of Yesa, where it crossed the River Aragón to continue towards Javier. Las peregrinaciones a Santiago de Compostela, in its chapter dedicated to the route between the Somport mountain pass to Puente la Reina, points out that the route continued at the foot of the monastery of Leyre, although its authors did not find any documentation or news about the passage of pilgrims in that area. 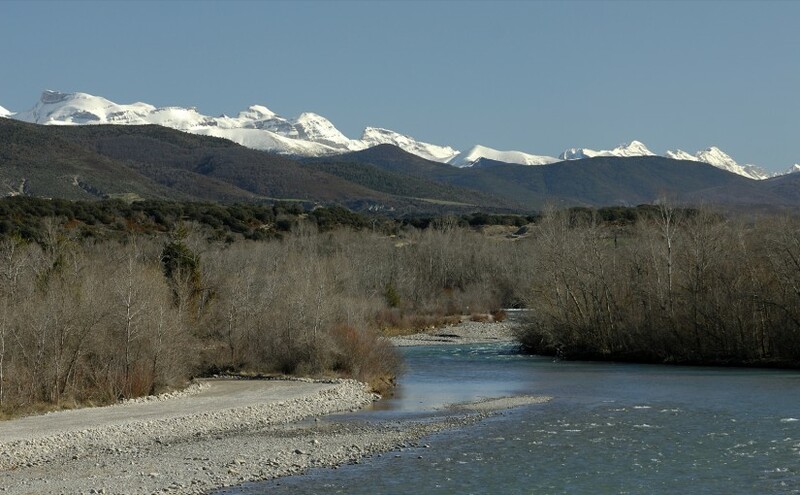 They added that the travellers crossed the River Irati near Liédena and headed to the Foz de Lumbier, where they crossed the riverbed again to go to Monreal. They point out that many other pilgrims, after leaving Yesa, made a stopover in Sangüesa, which would still be restocking when the Codex Calixtinus was written. In Rocaforte, the ancient location of Sangüesa, a large part of the Franciscan Order’s historians place the first stop of Saint Francis of Assisi in Spain during his pilgrimage to Compostela. Other scholars, however, claim that the Italian saint never went on pilgrimage to Santiago. With regard to the route from Sangüesa, it seems opportune to quote a excerpt from El camino a Santiago. Vías, estaciones y señales, by Arturo Soria and Puig :”In the 12th century, once you reached Sangüesa, it was shorter and more comfortable to go south of the mountain ranges of Izco and Alaiz and join the main road, not in Puente la Reina, but in points much more to the west, such as Cogullo or Logroño. The consolidation of these new routes would be contributed by the consolidation of intermediate towns such as Artajona, Tafalla or Olite, which also had pilgrims’ hospitals. 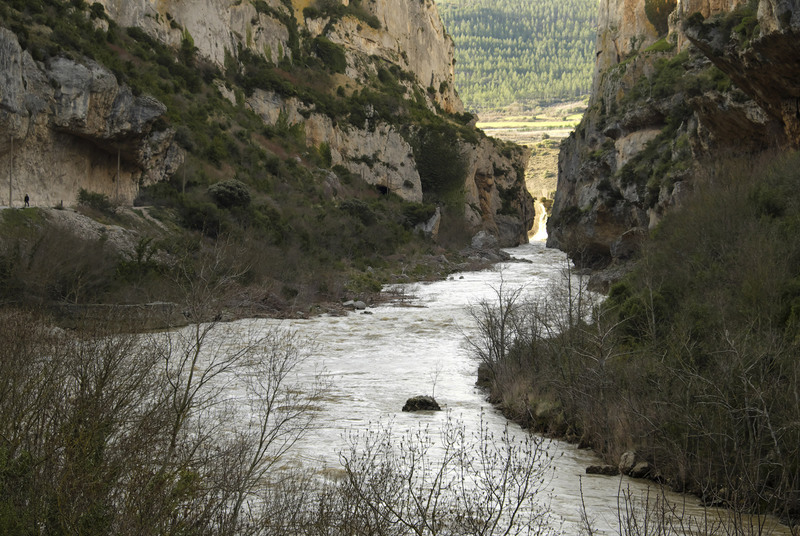 Finally, the existence of Ujué, the most important Marian sanctuary in the old kingdom of Navarre, ended up complicating the mesh of pilgrimage routes… In this way, these routes appear that could be used by local pilgrims, as well as by pilgrims to Santiago who diverted to Ujué and, once there, were tempted to go down to the Ebro Valley, where there was other secondary route from Catalonia and Zaragoza that joined the main one in La Rioja”. The statistics compiled by the Oficina del Peregrino in Santiago can not be any less encouraging for this pilgrimage route. They reveal that, in 2017, only 396 pilgrims out of the 301,036 who arrived in Compostela chose Somport as their starting point, which means 0.13% of the total number of walkers. Jaca, in turn, was the starting point for 133 pilgrims (0.04%). Meanwhile, beyond our borders, 120 pilgrims left Arles (0.04%). These figures, although significant, are indicative and do not reflect the total number of pilgrims who traveled the French Way through Aragon, as many of them would finish their journey in Puente la Reina. On the other hand, the French Way through Navarre still enjoys a splendid health; only the French town of Saint Jean Pied de Port attracted 33,177 pilgrims (11.02%); from Roncesvalles 6102 pilgrims started walking (2.03%) and 3870 made it from Pamplona (1.29%). 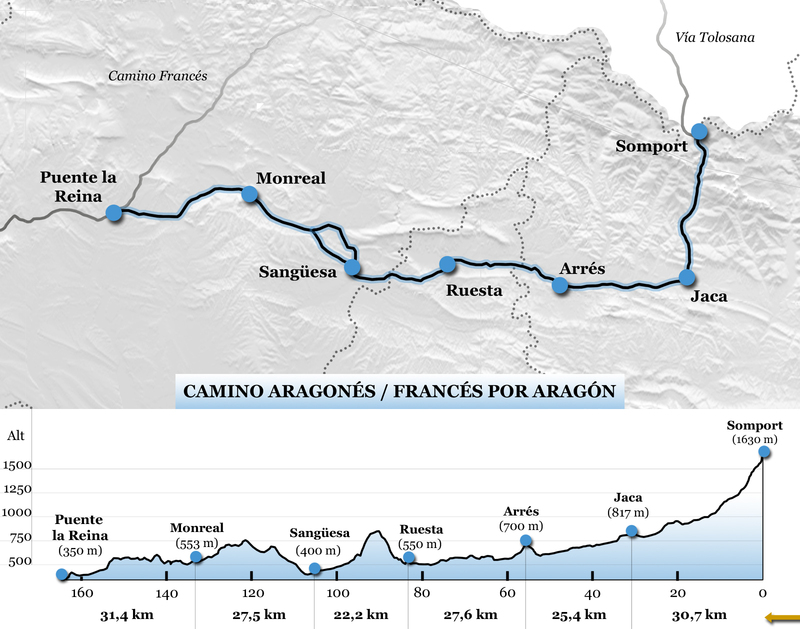 Several circumstances may be behind the scant success of the route through Aragón among pilgrims. Although the construction of a Welcome and Information Centre in a building at Canfranc International Station (which, incidentally, has already several private hostels) and a pilgrims’ hostel in the village of Canfranc was planned at the end of 2017, travellers have always missed the existence of a large public hostel to receive themselves at the Somport mountain pass, where they could gather information, obtain their credentials and stay overnight the day before departure. The low number of visitors on this itinerary has meant that for a couple of decades now, the number of lodgings for pilgrims on the Camino Aragonés has remained virtually unchanged. 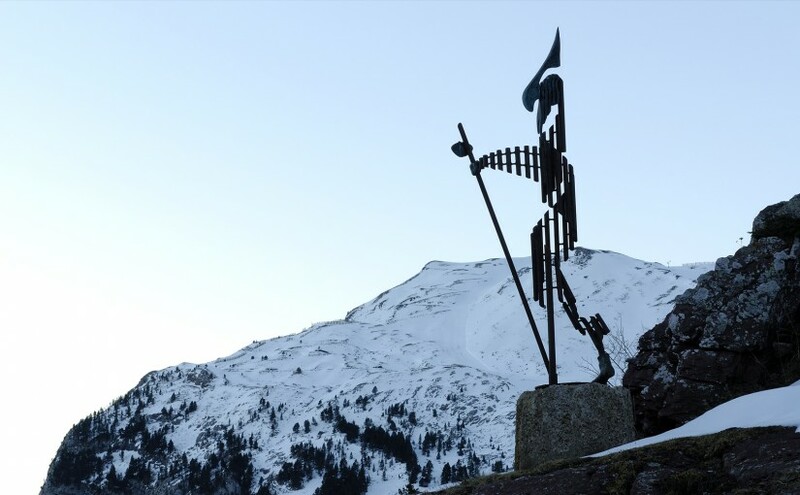 In addition, these accommodations are concentrated in the first stretch of the Way, driven by skiers who come to the stations of Astún and Candanchú and by mountaineers. 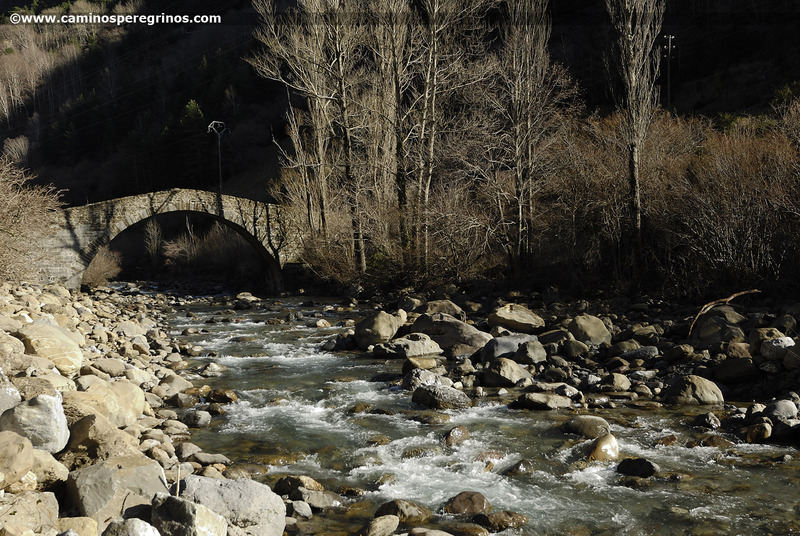 In this way, in the 30 kilometers that separate Somport and Jaca there are almost the same number of hostels as in the remaining 135 kilometers between Jaca and Puente la Reina. The American film The Way was released in 2010; it was shot along the Camino Francés that enters Spain through Saint Jean Pied de Port and Roncesvalles. If by that time it was the most common thing to start from one of these two locations, from The Way, the gap between accessing Spain through Navarre or doing it through Aragón was even more accentuated. The premiere popularized the Jacobean route in the United States and since then the number of pilgrims from Saint Jean or Roncesvalles, reliving the pilgrimage of its principal actor Martin Sheen, has increased considerably. In 2010 pilgrims from the United States made up 4% of the total number of pilgrims arriving in Santiago, only two years later its influx had risen to 7% and already climbed to 10% in 2017, being the largest group among foreigners after Italian and German pilgrims. The film has not only been a hook for American pilgrims, but also for many foreigners. If the producers had placed the beginning of the plot in Oloron-Sainte-Marie and Somport, surely the influx of Camino Aragonés would have been quite different. If the effect of the movie is a heavy handicap for the Camino Aragonés (Aragonese Way), several of the guidebooks most often used by English-speaking pilgrims, such as that of John Brierley, and that of Anna Dintaman and David Landis, do not take this itinerary into account. 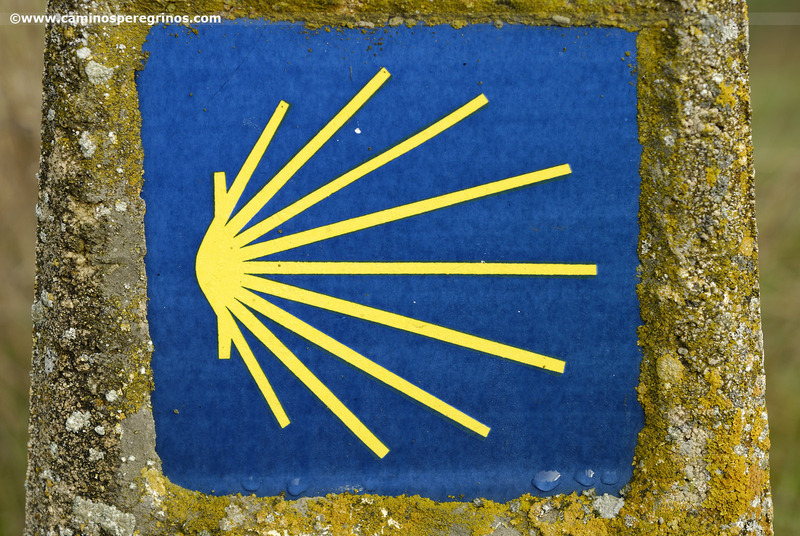 If this were not enough, the promotion and diffusion of this route has been scarce and erroneous, promoting more aspects that are outside the Camino than those that directly affect pilgrims and the pilgrimage route itself. The itinerary, however, treasures numerous attractions that so far have not been known to spread: a prominent place in the history of pilgrimages, grandiose landscapes, abundance of stretches of land against those of asphalt, an uncrowded itinerary that favors a more complete and rewarding experience and the like. 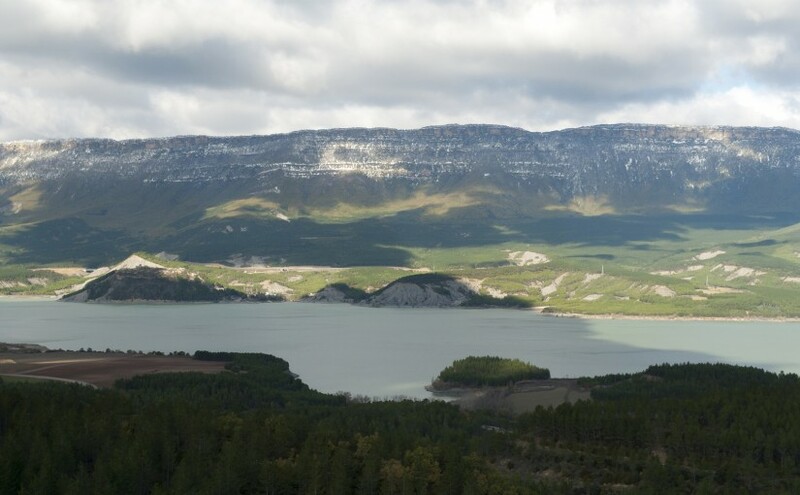 The Aragonese Way or the French Way of Saint James through Aragon is never disappointing and patiently awaits the arrival of more pilgrims to corroborate its charms. Liber Sancti Iacobi. Codex Calixtinus. Translation into Spanish of A. Moralejo, C. Torres and J. Feo. Edition updated by María José García Blanco and published by the Xunta de Galicia in 2014. Los Caminos de Santiago. Book written with the collaboration of Julie Roux and carried out with the advice of the Centro de Estudios Camino de Santiago de Sahagún. Published in 2004 by MSM. Las peregrinaciones a Santiago de Compostela. Reference work written by Luis Vázquez de Parga, José María Lacarra and Juan Uría Ríus. Facsimile edition published in 1998 by the Gobierno de Navarra. El camino a Santiago. Vías, estaciones y señales. Artwork by Arturo Soria and Puig. Second edition – corrected and extended – published in 1993 by the Ministry of Public Works and Transport. 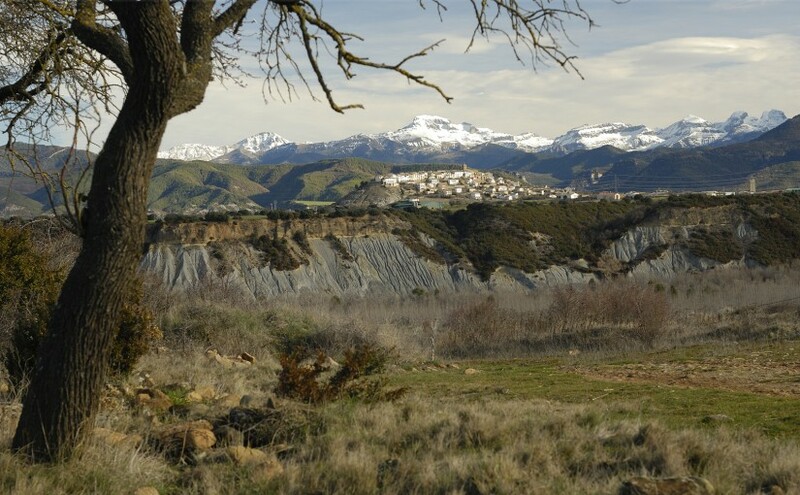 Guía del Camino Jacobeo en Aragón. Written and coordinated by José Luis Ona and published in 2010 by the Gobierno de Aragón. Item a Caesarea Augusta Beneharno. La carretera romana de Zaragoza al Bearn. Study and research by Isaac Moreno Gallo, published in 2009 by the Centro de Estudios de las Cinco Villas. Fernando el Católico Institution. 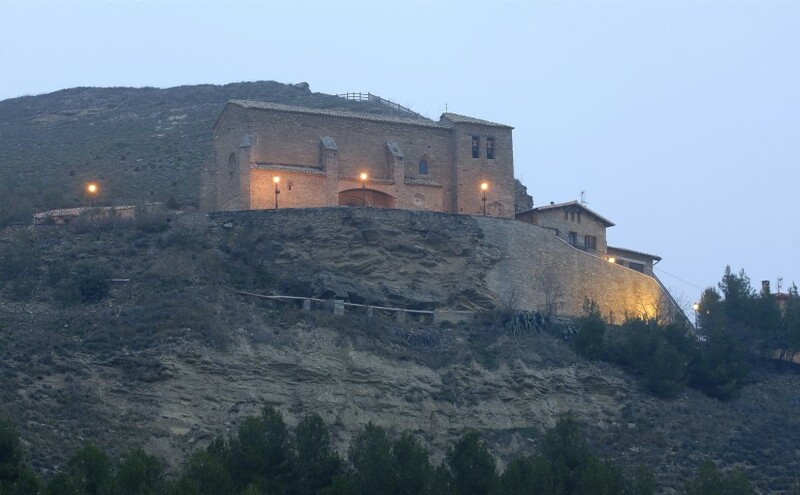 El Camino de Santiago y la Ciudad Ordenada en Aragón. Idea, curatorship and text by Ramón Betrán Abadía. Published by the Diputación General de Aragón in 1999.